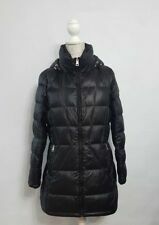 ZARA BLACK QUILTED DOWN COAT SIZE M. Condition is New with tags. Dispatched with eBay delivery – Shutl 1 day. Details - Waterproof, Quilted with Down Lining, Removable Hood with Faux Fur Trim, Chunky Two Way Zip. Squiggle Pre-Loved Clothes 💚. Very good condition hardly worn. A few minor marks nothing major.